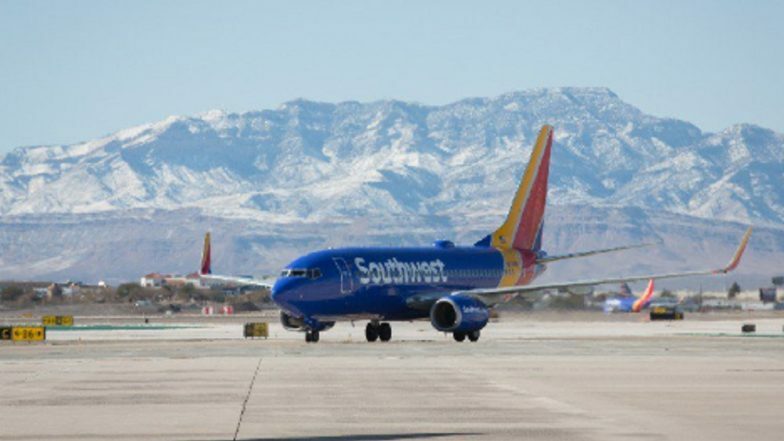 Orlando, March 27: A Southwest Airlines 737 MAX 8 aircraft made an emergency landing at the Orlando airport on Tuesday (local time) after it experienced engine-related problems, the US Federal Aviation Administration (FAA) said. Notably, the plane is of the same make as that which was grounded in several countries earlier this month in the wake of two recent deadly crashes, citing safety concerns. The jet was on its way to a storage facility in California and was not carrying any passengers. It took off from Orlando airport at around 2:47 pm (local time) after which the crew reported that there was a performance issue in the engine, USA Today reported quoting the FAA. The plane then turned back and made an emergency landing back at Orlando at around 2:58 pm (local time). The FAA said it was investigating the incident. Boeing 737 Max 8 Crash Row: Garuda Indonesia Axes Order for 49 Aircrafts. Meanwhile, Southwest Airlines spokesperson Dan Landson said: "The crew followed protocol and safely landed back at the airport." The grounded aircraft will now be shifted to Southwest Airlines' Orlando maintenance facility for a thorough review, the spokesperson said. The incident is expected to raise eyebrows over safety issues as Boeing continues to struggle to recover from the 737 MAX crisis. Boeing is under international scrutiny in the wake of two fatal crashes in the last five months involving the 737 Max 8 jet. A Lion Air flight crashed in Indonesia in October last year, and an Ethiopian Airlines plane crashed earlier this month. Neither of the crashes left any survivors. Investigators have revealed that they found similarities in both the plane crashes. In the aftermath of the March 10 Ethiopian Airlines crash, shares of Boeing have plunged more than 10 per cent, wiping more than 25 billion dollars off the company's market value. In a statement earlier this month, Boeing had said that it remains confident in the safety of the jets, but that it recommended the shutdown itself "out of an abundance of caution and in order to reassure the flying public of the aircraft's safety".